London Met’s freshers’ activity starts on Monday 24 September 2018. We have an incredible package ready for all you lucky new starters. We also hold two great Freshers’ Fairs at our Holloway and Aldgate campuses, for you to learn all about uni and get some great deals and freebies. The best place to get most up-to-date information is by following our Facebook page and our @londonmetevents Twitter feed. Our two Freshers’ Fairs are held in Aldgate campus on Wednesday 3 October (at The Wash Houses, 11am – 3pm), and at Holloway campus on Thursday 4 October (held in The Great Hall and The Rocket). 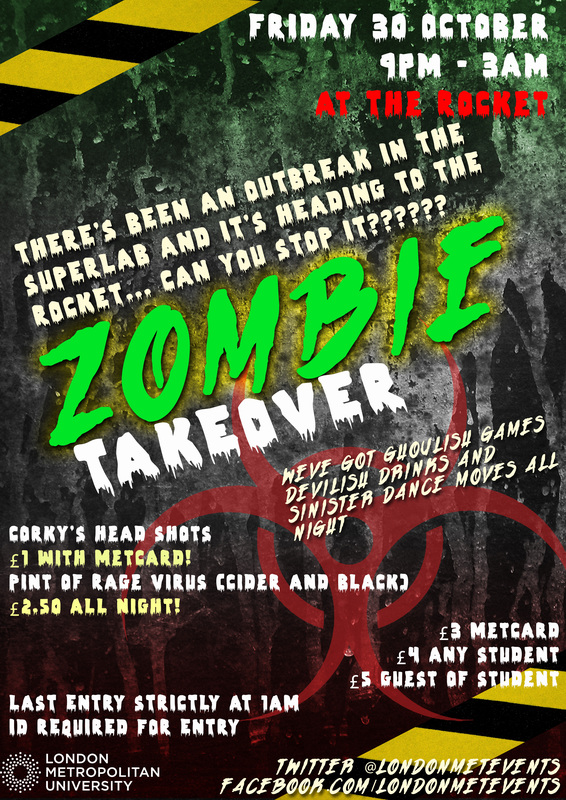 Make sure you don’t miss out of the Freshers’ Finale… it’s the biggest event during the start of year festivities, and is always a sellout! You have to buy a ticket for this one, but they are super cheap and students can buy two guest tickets too. All the most up-to-date info will be on our Facebook and Twitter… we regularly post content about uni life and what’s on, so give us a follow, say hello and keep in touch! Use the hashtag #londonmetfreshers when posting to get featured and maybe win prizes! We’re busy planning all the brilliant Freshers welcome activity for our new and returning students, and can’t wait for September! 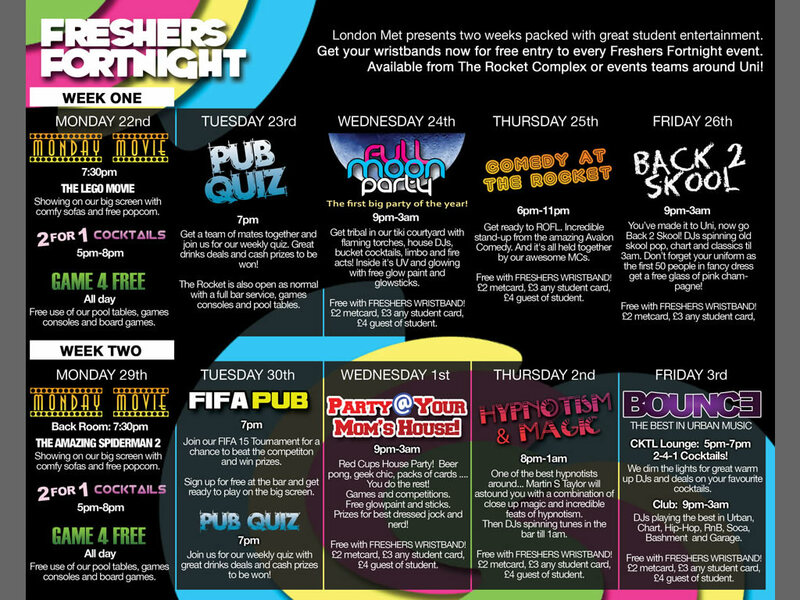 London Met Freshers Week starts on Monday 26th September. 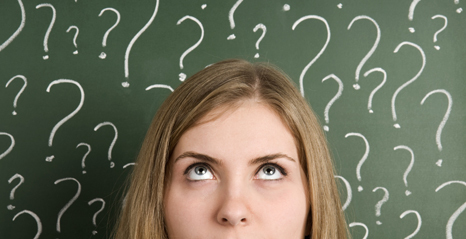 All the most up to date info will be on our facebook and twitter, keep in touch! After Pay Day comes THE PARTY! Join us at The Rocket on Thursday 3rd March for #TakeMeToRio – we’re bringing Rio Carnival to Holloway! Have a Caipirinha cocktail and dance to Brazilian carnival music fused with popular chart hits! DJ RNT knows how to get the party started. He’ll provide the Brazilian Bossa Nova/Samba sound, a little bit of Afrobeats, Soca and of course some House Music! The 1st 50 people to arrive will get a FREE whistle! Dress as colourful as you like – photos will be taken on the night by Sharpington Photography. We have a special performance on the night from Taste of Brazil carnival samba dancers … You CAN NOT miss that! LMU students may sign in up to 2 guests. Guests must bring Photo ID. Students from other uni’s welcome! Karaoke Night! 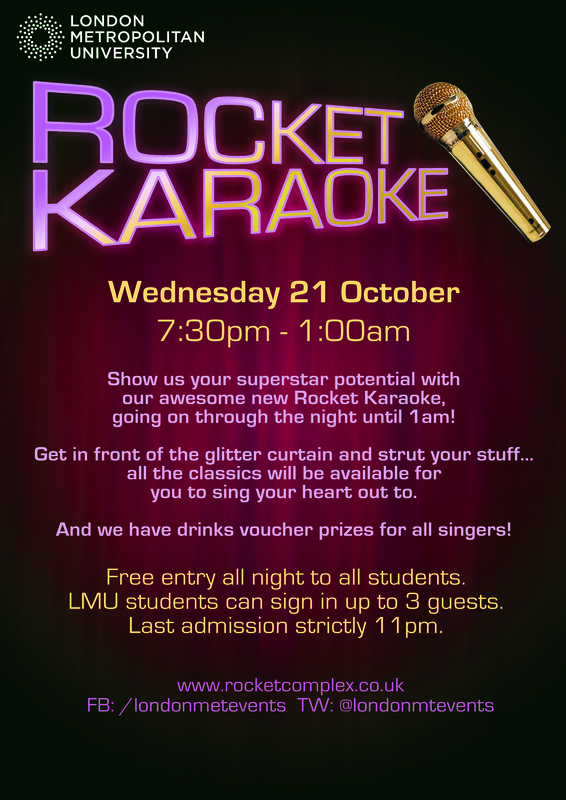 Sing, drink and boogie this Wednesday from 7.30pm till late! 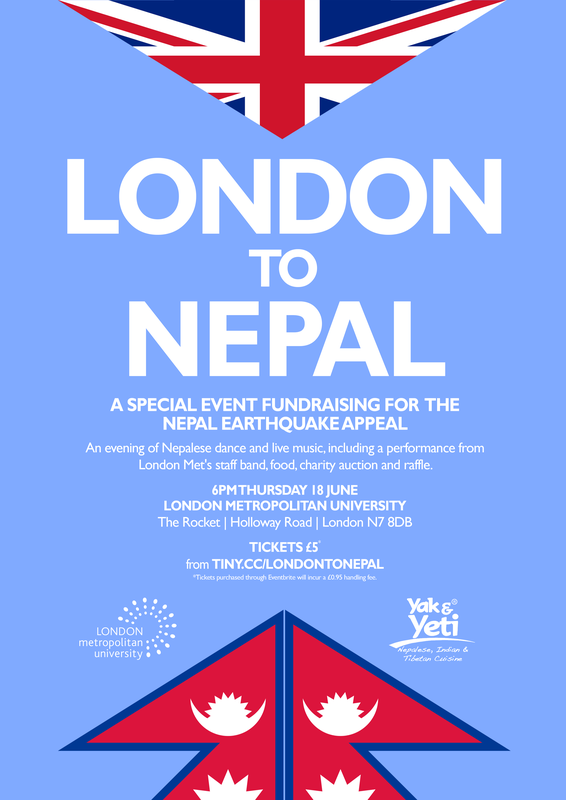 London Metropolitan University is holding an evening of entertainment in support of Nepal. You can expect great food, dance and live music. Come to see the students and staff of London Met performing on the night, including The Last Hurrah (the University staff band) and many more. You will experience a Far East atmosphere mixed with British culture. There will be great prizes in the raffle (you get free raffle entry with your event ticket), a quiz to take part in, and exquisite items in the auction! Come to celebrate different cultures with us and support a good cause on Thursday 18th June. The event is in The Rocket ground floor venue from 6pm. Please book your tickets on tiny.cc/londontonepal. Bring partners and friends, everybody welcome! (Under 18s must be accompanied by a parent or guardian – I.D will be requested). End of Year Summer Party at The Rocket – Friday 29th May at 8pm! 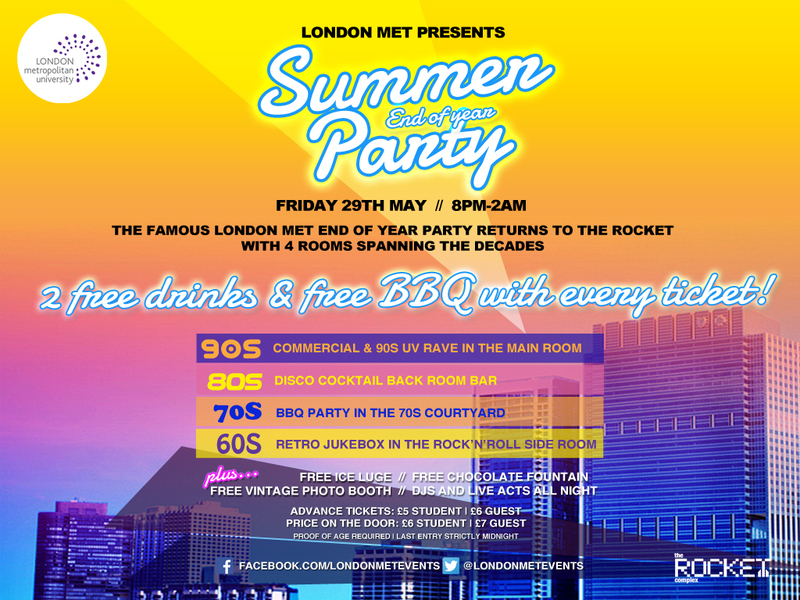 The Summer Party is the end of exams and the start of the Summer for London Met students!! You’ve got 3 deadlines all for the same day, a presentation the day after and then all your spare time revising for all 1258962 of your exams, apart from when you’re procrastinating reading barely interesting articles such as this. WHEN WILL IT END? Well, it will end soon. Trust us. And what better way to celebrate when it does by having a party at your favourite student bar. We’re talking about The Rocket Complex of course. The big end of summer party 2015 is coming to you on Friday 29th May, and it’s going to be the best yet. Doors open at 8, and you’ll be welcome to a decades themed party with 4 rooms of music, each styled in a different decade! 90s Glow Rave main room – There will be more glow sticks than you can fit on both wrists, and glow paint for those that want it. We’ll be playing all of your favourite chart, dance and house music, plus a few golden oldies for good measure. 80s Disco Cocktail Back Room Bar – Have a boogie in the Disco Cocktail bar where we’ll be serving delicious cocktails and pitchers all night, and have classic disco tracks playing under the massive mirror ball. 70s BBQ party in the Courtyard – Chill out in 70s courtyard where we’ll be serving delicious BBQ food (which is free with your ticket). We’ll also be playing a mixture of 70s tracks, and have a free photo booth for everyone to use. 60s Retro Rock and Roll side room – The side room will be turned into a rock and roll dream, with a free jukebox to play all your favourite songs, as well as a chocolate fountain and ice luge. Tickets include an AWESOME 2 free drinks AND free BBQ in the courtyard. This is GOOD NEWS. So we’ll see you on the dance floor you beautiful people. Now get back to revising! Upcoming events at The Rocket! Welcome back to a brand new term at #Londonmet! Well done on finally making it through your exams. Now they’re over, The Rocket is back to it’s normal opening hours, 8.30am-11pm from Monday – Friday, and we have some fresh new deals on offer for you at the bar! 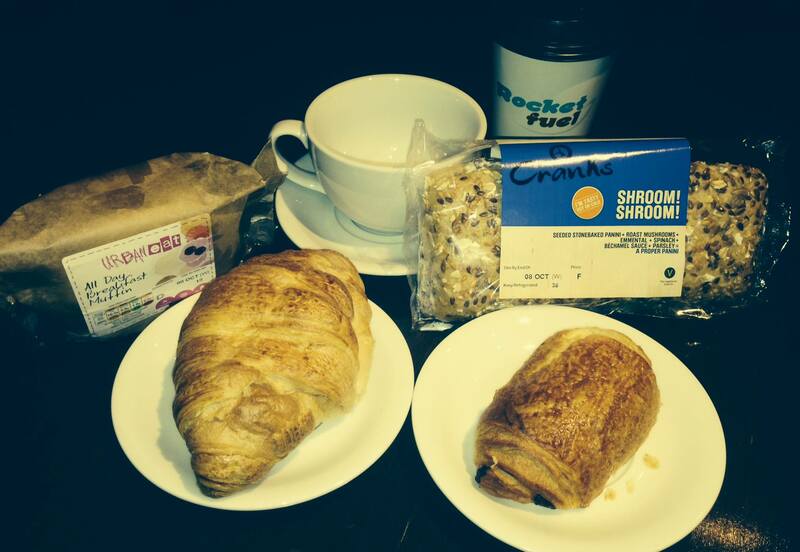 – Power up anytime of day with a Panini and Redbull for £4! 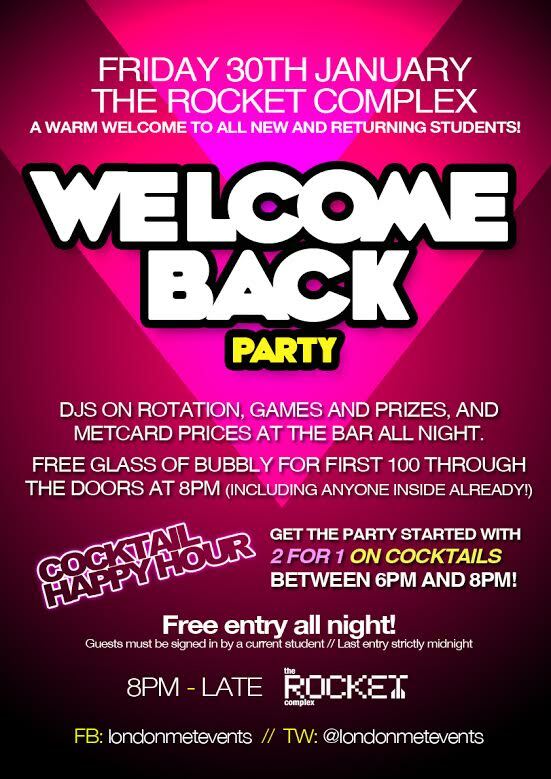 And don’t forget our huge Welcome Back Party for all of our new and returning students this Friday! It’s FREE entry all night, and a FREE glass of bubbly for the first 100 people through the door from 8pm (including those already in the venue). And you’d be a fool not to be as we have 2-4-1 cocktails from 6pm-8pm! Then we’re open until late with DJs on rotation, MetCard prices on the bar all night, free nibbles and loads of giveaways and prizes to be won. All details can be found here. We also have the Verve Radio and Magazine London Met SU Launch Party coming up on Friday 13th February. All details can be found here. We look forward to seeing you all back in The Rocket. And if you haven’t already, don’t forget to grab your FREE MetCard from behind the bar for even more discounts!